Slate is lauded for its beauty and longevity. Although it will last you a century or longer, slate tiles may become chipped or damaged in some capacity. This is normal, as any surface is prone to normal wear and tear. With regular maintenance and repair, your slate will reach its true potential lifespan. 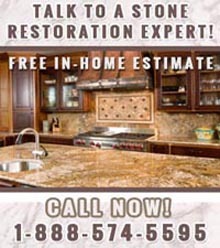 Statewide Stone Care employs care and professionalism when performing slate repair in NYC. Our expert stone professionals are knowledgeable and experienced in many types of stone, most certainly including slate, and know the proper methods to promptly repair your slate and return it to it's beautiful state. First of all, the cost is important for most of us. While slate is durable and aesthetically pleasing, the material is pricey. We don’t need to tell you that. Slate repair in NYC will save you an incredible amount over installing brand new slate tiles. We can restore the tiles to look brand new and it won’t cost you an arm and a leg. First we will prep your home by closely inspecting your tiles for any damage. If any sections have missing tiles, we will reinstall that area. Also, we will look for torn, ripped, or cracked tiles. Slate will stand strong against heavy weights and nature’s threats, but the tiles may still have cracked or worn away in some places. As already mentioned, tiles or sections may need to be replaced. If any large scale damage is found around any specific areas, we may have to replace the tiles for the entire location. Still, this work is prompt and much more affordable than getting an entirely new slate installation done. You may be thinking that you can tackle these repairs on your own. We are not doubting you, but we offer a warning. We’ve seen many professional construction workers fail with slate. It’s just not an easy material to install or repair. So be warned, and give us a call for slate repair in NYC. Throughout the years, we’ve grown quite accustomed to slate. We’ve learned from experience and through rigorous training how to handle this natural stone surface. You’ll see our quality shine through our work, and that’s a guarantee. When you notice a crack or blemish in your slate, don't hesitate to call the experts at Statewide Stone Care for professional, prompt, and affordable slate repair in NYC at (888) 574-5595. Our past customers have fallen back in love with their tiles once we finished our jobs! For more reasons to choose us to care for your tiles, please see our slate repair in NYC reviews.